The single level high set house is designed for the climate, privacy and your comfort. Each wing of the house has 2 bedrooms, a bathroom and a separate toilet. This allows 2 families or groups to share and still retain their privacy. It is fully self contained and fitted out with commercial crockery, cutlery, glassware and all cooking items. Orchid Beach is in the peaceful north of Fraser Island. Get away from the resort settlements of Eurong and Happy Valley to relax, fish, 4wd and experience all the magic Fraser has to offer. 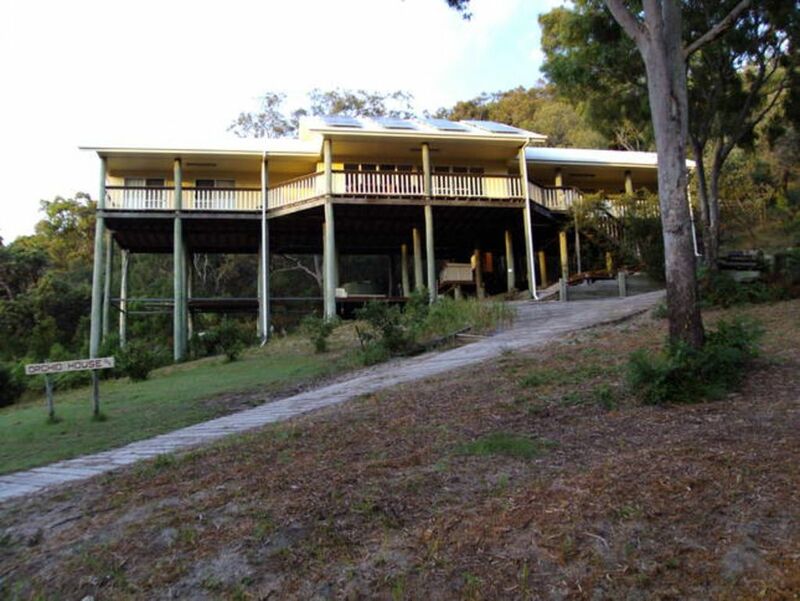 The house is set on a high private block backing on to National Park bushland. First time visitors to this very large island who want to "do Fraser in two days" will find the Resorts at Happy Valley, Eurong and Kingfisher Bay busier but more suitable places to stay. We are better suited to a more relaxing 5 night minimum stay. The island is 4WD only, the "roads" are sand tracks, and the eastern beach at or near low tide. Orchid Beach is famous for its variety of scenic and fishing spots. On the western side you can catch mud crabs in Wathumba Creek, pump yabbies on low tide at the mouth and catch Whiting, Bream, and Flathead on the rising tide. Remember sand flies live here also. The North Wathumba track takes you to beautiful Platypus Bay on the western beach where in season you may spot whales. This area features pure white sand and calm beach conditions ideal for children. The eastern beach of Marloo bay feature the magnificant rocky headlands of Waddy point and Middle rocks with Champagne Pools accessable by boarded walking track. From the high points, turtles, rays, dolphins, sharks and whales may be observed. Bird watching is a favourite past time on the island with 354 recorded bird species, largest being the spectacular white-bellied sea eagle (Haliaeetus leucogaster), frequently observed along the beach. Wallabies and the famous Fraser Island dingos may be frequently observed. Please be aware dingoes are wild animals - closely observe young children. Four wheel drive and explore the untouched beauty and isolation of Sandy Cape in the Northern part of the Island. Walk the "vehicle free" beach of South Waddy, swim in Ocean Lake, one of Fraser Islands famous fresh water lakes, or just relax, put your feet up and watch the sunsets from the veranda or beach. Mattress protectors, Doonas and Pillows provided You will need to supply your own sheets and pillow cases. We had a absolute ball staying here! Beautiful place! The house had everything we required to make our little get away enjoyable and hassle free! We will be back! Thanku we had a great time,I have never had a bad time at Fraser yet. Our group of 8 adults stayed at Orchid House for a week in August 2016, mainly to fish for tailor. The accommodation was comfortable. The kitchen was clean, tidy and practical. We spent most of our time there on the verandah. The down stairs area is useful for storing gear, and cleaning rods and waders. Orchid House is clean, comfortable and practical. It needs a new chest of draws in our bed room, and I would prefer an outside fish filleting table (which it does not have). An enjoyable stay which I would recommend. Fraser Island accommodation in a self contained rental house at Orchid Beach Queensland in the heart of the National Park and a World Heritage Listed Area. Within 10 minutes of Indian Head, Champagne Pools, Waddy Point, Ngkala Rocks and Ocean Lake, the House was carefully designed to take advantage of the island's mild sub-tropical climate and to maximise your privacy and comfort. It is fully self contained, beautifully fitted out and the white sandy beach is only 400 metres from your door. Orchid Beach is on Marloo Bay in the north east of the island and is the peaceful alternative to the busier southern resort settlements of Kingfisher Bay, Eurong and Happy Valley. We don't have a resort hotel, heavy beach traffic, tour buses or day-trippers and the nearby vehicle-free beach between Waddy Point and Champagne Pools is popular with families. Swimming: Children can swim in the saltwater Champagne Pools, the freshwater Ocean Lake, and the numerous shallow lagoons and low tide gutters along the beach in the sheltered bay, or climb and slide down the many high sand hills. 4WD: A 35 kilometre drive north will take you up the beautiful wilderness area beach to Sandy Cape and around the tip of the island to the historic lighthouse and wartime bunkers. Please drive carefully and don't disturb the nesting turtles or sea birds. You are only 30 minutes from the island's western beach at Wathumba Creek and Platypus Bay where whales rest with their calves on their annual migration south. The Wathumba Creek estuary is renowned as a bream spawning ground and for the abundance for flathead, whiting and mud crabs. The Orchid Beach to Wathumba track crosses 16 kilometers of varied landscape containing unique flora such as the Orchid Beach native orchid, palms, ancient cycads, grass trees and beautiful seasonal wildflowers on the wallum heathlands.